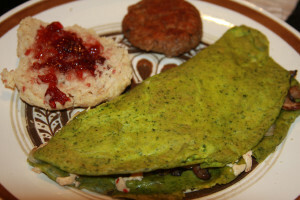 Make a tofu omelet & crack a book instead of an egg! What makes this batter taste “eggy” is the black salt (a.k.a “kala namuk”) which you can order online, or find at a health food or specialty store. (FYI black salt has a sand-like texture and is dirty-pinkish in color. It isn’t actually black.) You could always leave it out as well, but it is the sulfur in the black salt that really gives it that eggy flavor. First cut one hat shape out of each piece of white cardstock. 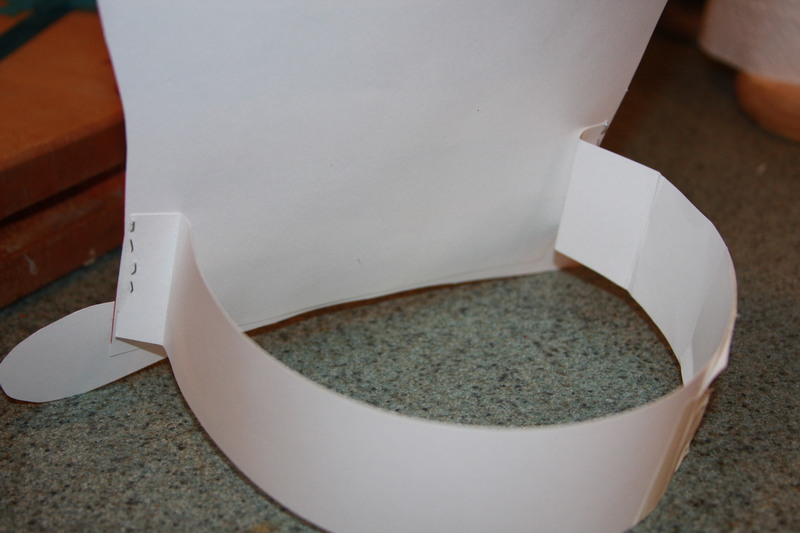 Then use another piece of white cardstock for the 2 bottom parts of the hat. 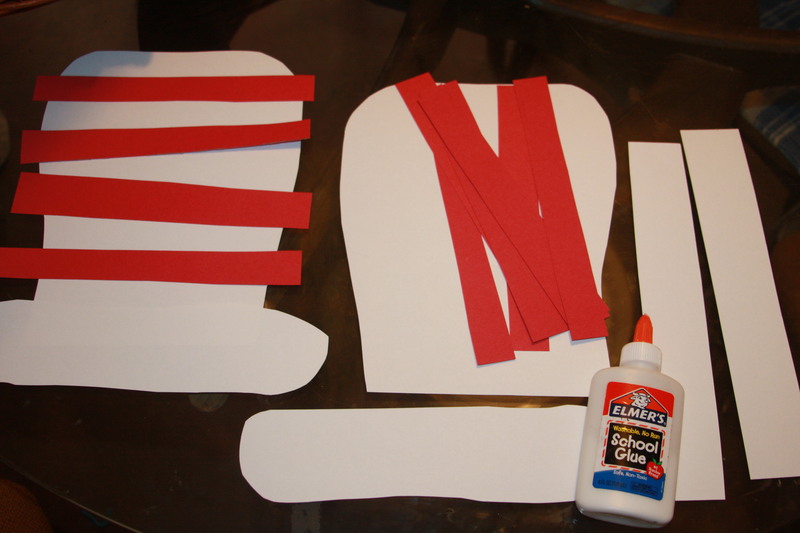 Then you will need several long strips of white cardstock that you will use to tape together for the headband part (last). Cut a bunch (like 10) of red construction paper stripes. Your basic hat making supplies… here is everything all cut out and ready to go! (note: we did end up cutting the bottom hat piece skinnier). Now, the fun part! 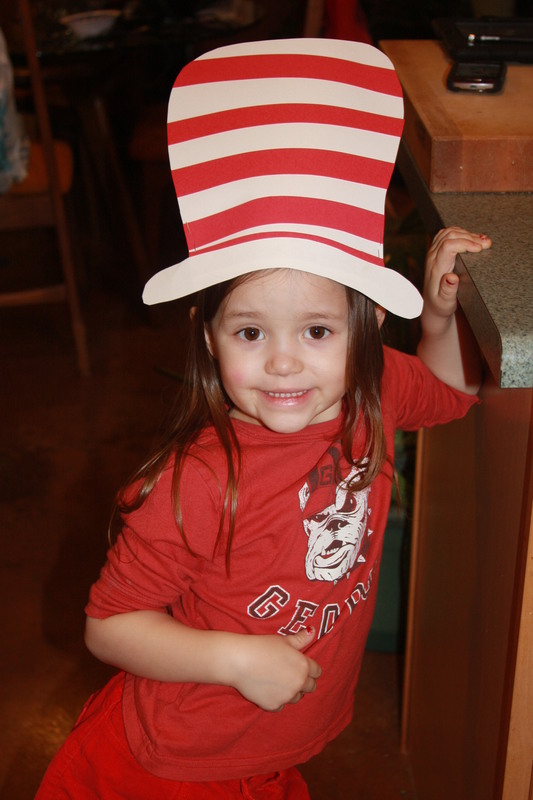 Let your kids glue the red stripes onto the hat! We used a glue stick to keep it from getting bumpy from using too much glue. Make sure the kids cover the strips completely and then smooth them down well. After all the stripes are glued on, trim the excess of the edges. 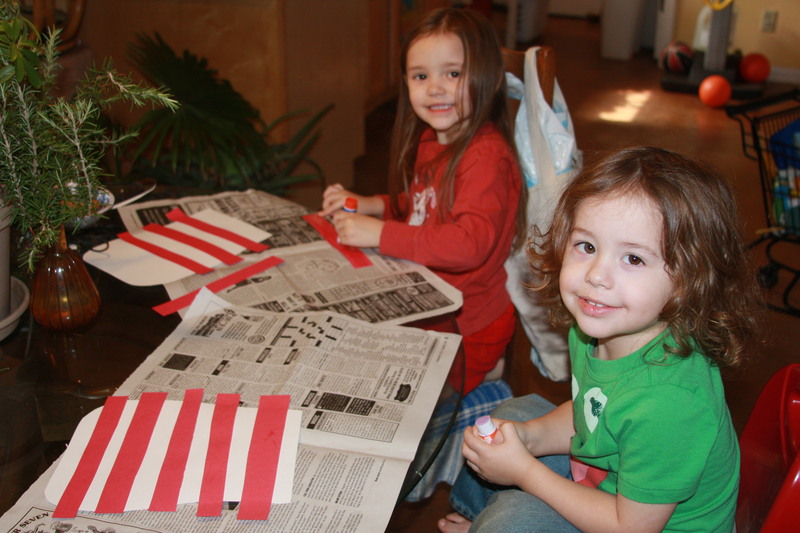 My kids LOVE cutting and pasting!! Next, I glued the bottom part of their hats on and set them under something heavy to flatten them while they dried. 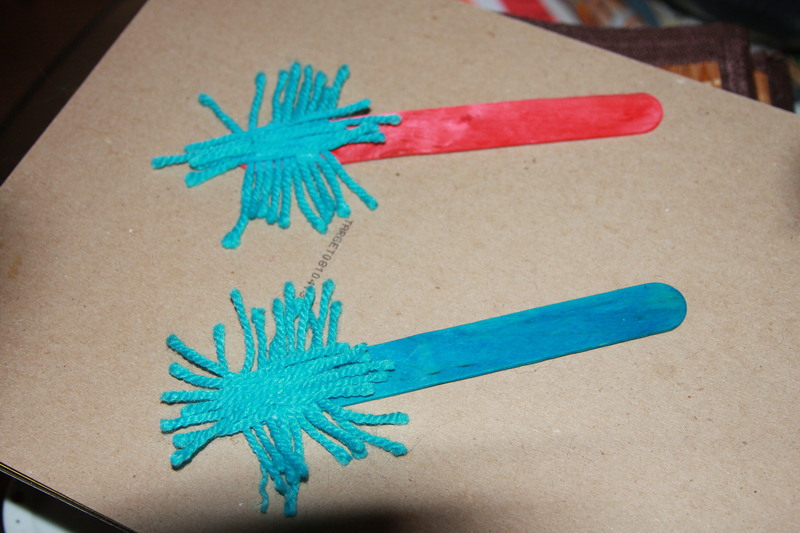 Once dry, staple 1 headband strap to each side of the bottom of the hat with 2-3 staples and fold edge slightly (I stapled vertically)… and I ran out of staples, which is why my kids arent pictured together! Here you can see how i folded and stapled the straps to each side, and taped the middle after “the fitting”. Fit your hat around your child’s head and tape the straps together where they meet! Voila! 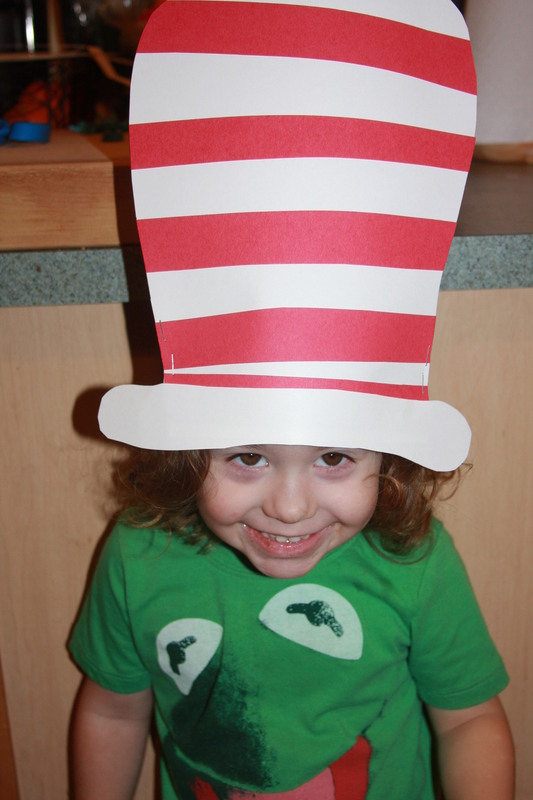 Your kids look just like the Cat in the Hat (but without all the hair!). You could even paint their faces like cats, if you so desire! I know my little cat lovin’ girl would be all about that! There’s a spunky new cat in town, Dr. Seuss!! If you have this stuff, you can make a Thing! First glue the yarn-hair on. I did this part myself because it was a little tricky and sticky. 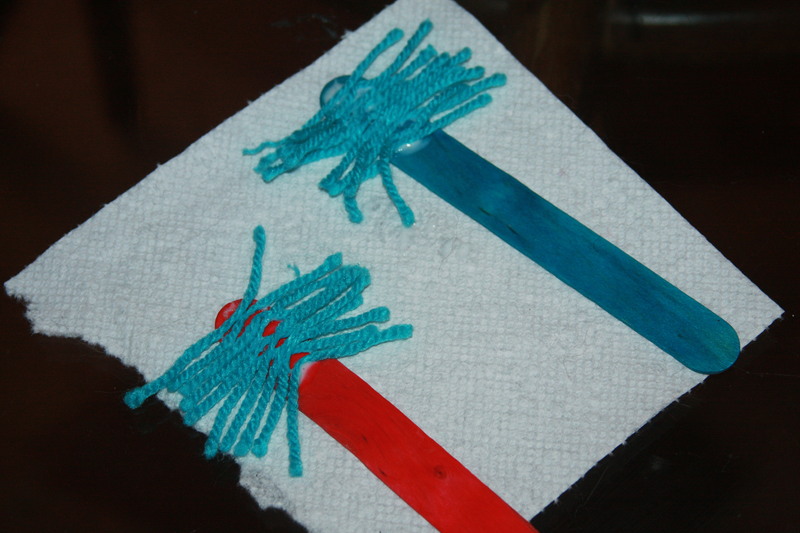 First generously apply glue (real glue, not a glue stick) to about 1″ of the end of the popsicle stick. Lay hair across it horizontally and then generously add more glue and lay more hair vertically. Tap it gently to push it down (be careful! It gets sticky fast and then it tries to glue the yarn to your finger!). Set aside until completely dry (several hours). Now carefully glue some yarn in the other direction. Let dry for several hours! 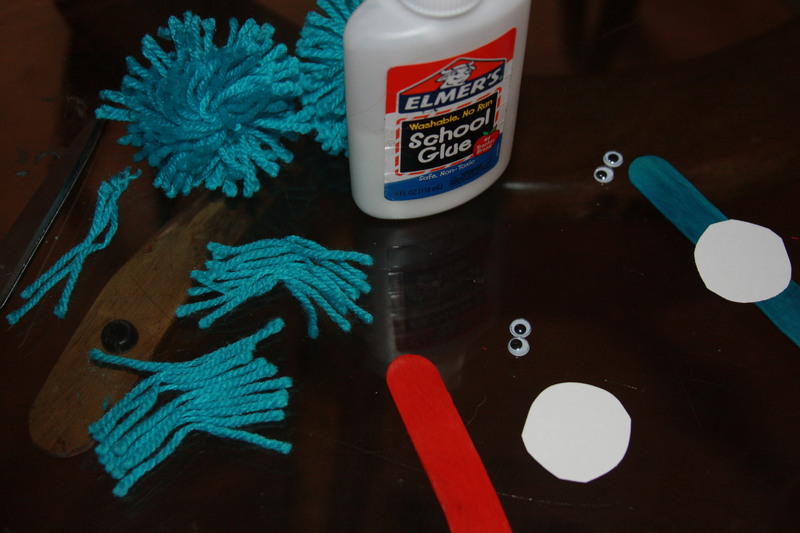 Next, decide where you want to glue on the googly eyes and the circular name-tags. You can add a mouth, eyebrows, etc. if you want to give it an expression! Voila! 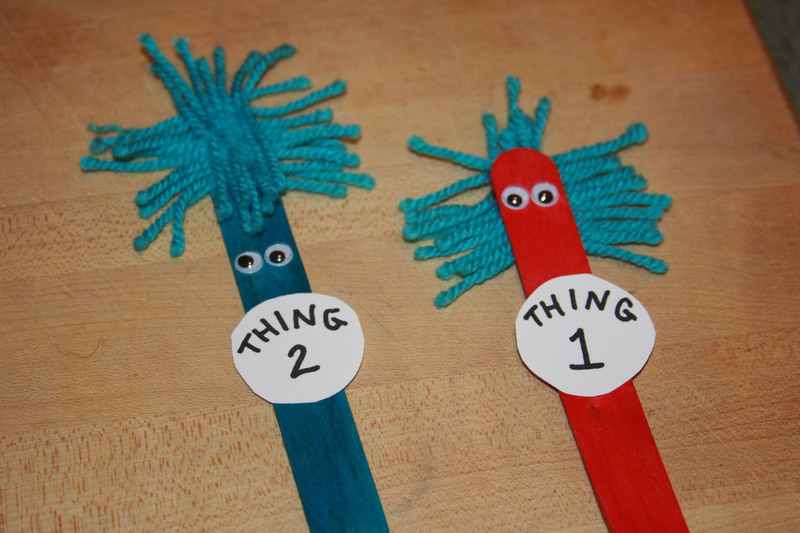 Your very own Thing 1 & Thing 2 to play with… guaranteed to be less trouble than the real ones!! At first I thought the glued part of hair would be the back… but maybe not! 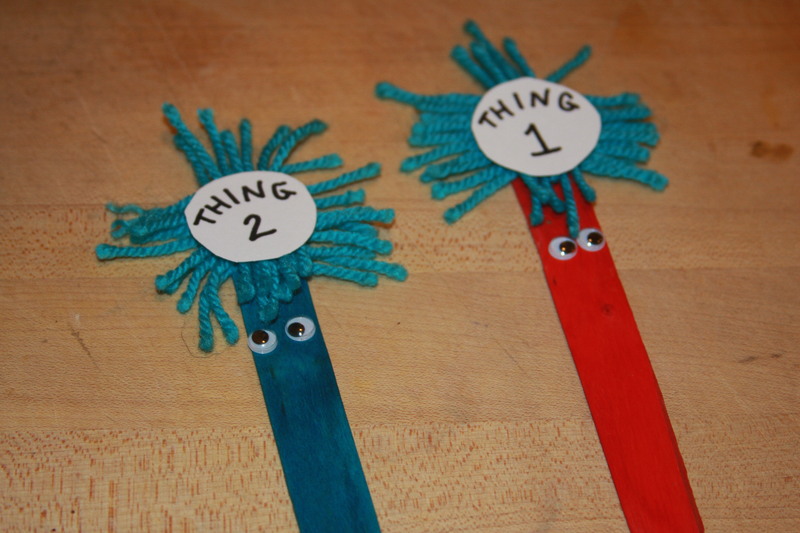 The first one looks more like a “wild thing” Thing! I like him! You could even position their name-tags up top of the yarn. You decide how you’d like your Thing to look! I hope you liked our crafts today, it was too cold to go out and play! So go buy your tofu & your kala namuk… cook up a green breakfast and then go read a book! Happy Birthday Dr. Seuss!! This little trickster cat looks ready to get into SOME kind of trouble! I really can’t believe another year has come and gone. Every year, each of us have personal resolutions, goals to achieve, things we want to cross off our to-do lists or our bucket lists… but what have we really achieved as a whole? Are we kinder people? Are we living the lives we were meant to? Are we believing in and helping each other? These are among the questions I am personally asking myself on the eve of a new year. I don’t mean to give myself a hard time, but I can’t help but feel there is always more that can be done. There is always more a heart can grow (remember that the Grinch’s heart grew 2 sizes just in one day alone! ), more a soul can aspire to, and there is always more help that can be given! One of my goals this year will be to blog more often, since I believe that eating vegan & sharing these recipes is definitely as step towards living a kinder life in general. I also want to play more music (namely the ukulele, guitar and the piano) and letting my emotions out through art. I used to achieve those two goals rather easily before I had children, but now, my kids take up a lot of my free time. (Even though “more sleep” should be on my list for the upcoming year, I may end achieving more of my resolutions by going to bed later & getting up earlier! I have been meaning to see more sunrises…) What are some of your dreams for the next year? No kid can turn down a Wookie-cookie!! Just try!! These “traditional” gingerbread cookies are easy and yummy. And since they contain molasses, they are high in iron – which makes them the perfect cookie for little vegans! I put “traditional” in quotations because I’m not sure how “traditional” Chewbacca gingerbread cookies are! This is our first time making them, but they will surely be a X-mas tradition in our house from now on! (We got Star Wars cookie cutters & pancake molds from Williams-Sonoma as an early Christmas gift.) This dough cuts best when cold, so roll it out in sections and keep the rest refrigerated until your ready to use it! 1) In a large bowl, stir together the oil, sugars, molasses and soy milk. 2) Add the flour, baking powder, baking soda, ginger, cinnamon, nutmeg, cloves and mix until well combined. 3) Collect the dough into a ball, or 2-3 flattened discs, and wrap in parchment or plastic wrap. Refrigerate for at least an hour. 4) Preheat the oven to 350. Roll out the dough. Make it thin for crispy cookies or make it thicker for chewier softer cookies. Here are our Chewbacca cookies, before baking. 5) Bake on a parchment lined baking sheet for 9 minutes (for soft and chewy) to 12 minutes (for thin & crispy). Transfer to wire rack and cool. Ice the cookies when cooled. To make icing: mix the powdered sugar and soy milk in a plastic baggie by massaging it around until it is thick like toothpaste consistency. Then cut off a tiny tip of one of the corners and ice those cookies! Then sit them aside until they the icing hardens. There is (what I’m sure is) another great gingerbread cookie recipe here. Also, these sugar cookies are easy and great for any occasion. We will be making them in a day or two. I am also hoping to get around to making some of these cookie jars & these coffee fudge brownie jars as gifts! Mmmmm!! With all the hustle and bustle of holiday shopping and things to do, it’s easy to forget that Christmas is the season of giving… so be sure to spread love, kindness, & peace on earth everywhere you go. Make it your mission to remind others who may have forgotten… It IS a wonderful life!! 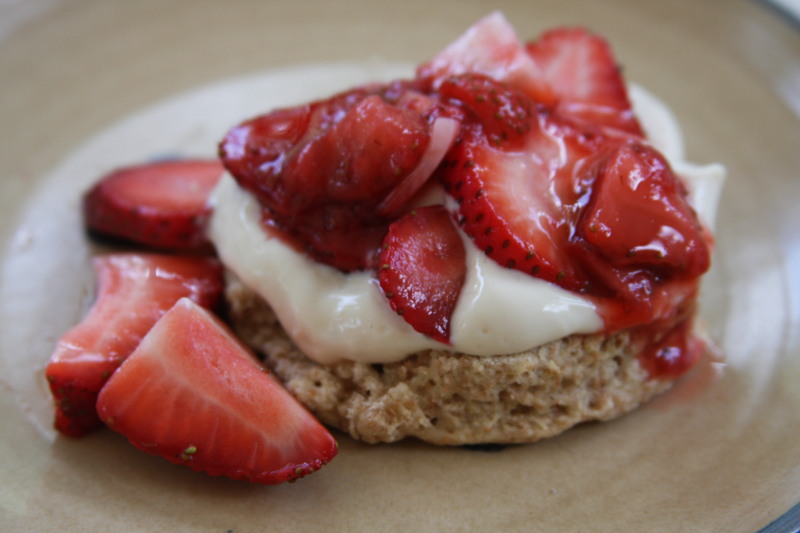 If there is anything I remember seeing at the Farmers Market lately, it’s berries – especially strawberries. 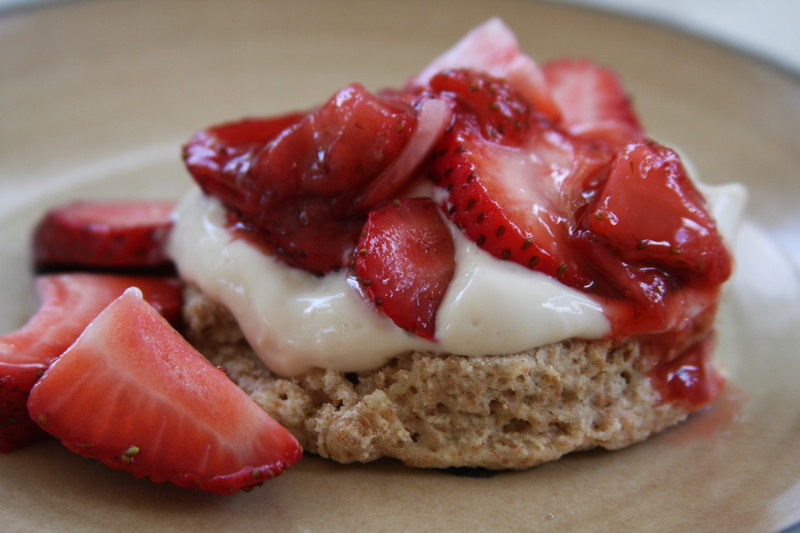 Go grab yourself some strawberries or blueberries this weekend and surprise your loved ones with this amazingly simple shortcake. 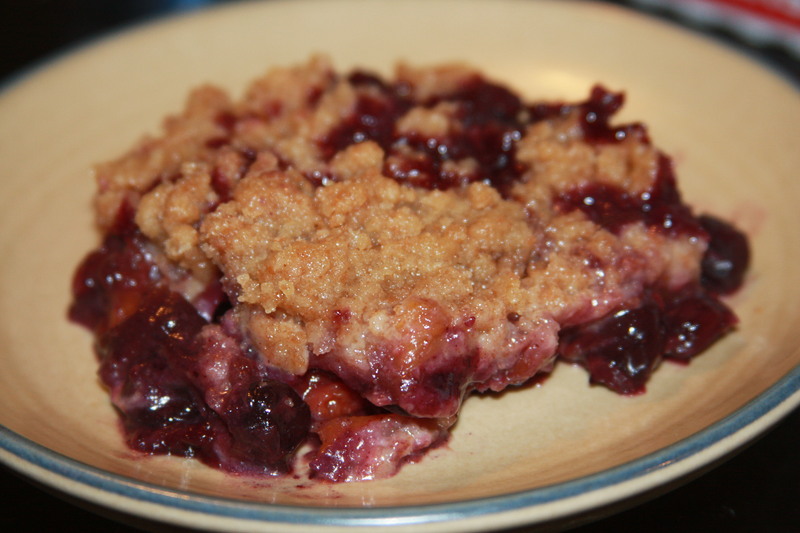 This recipe can be used with either strawberries or blueberries… or even peaches, though I’ve never tried those… yet! I would recommend making the vegan whipped cream ahead of time to get it nice and cold in the fridge. It will last up to 5 days!… If it lasts that long! Preheat the oven to 400 F. Combine the flour, sugar, baking powder, and salt in a large bowl. In a small bowl, combine the coconut oil, water and extracts. 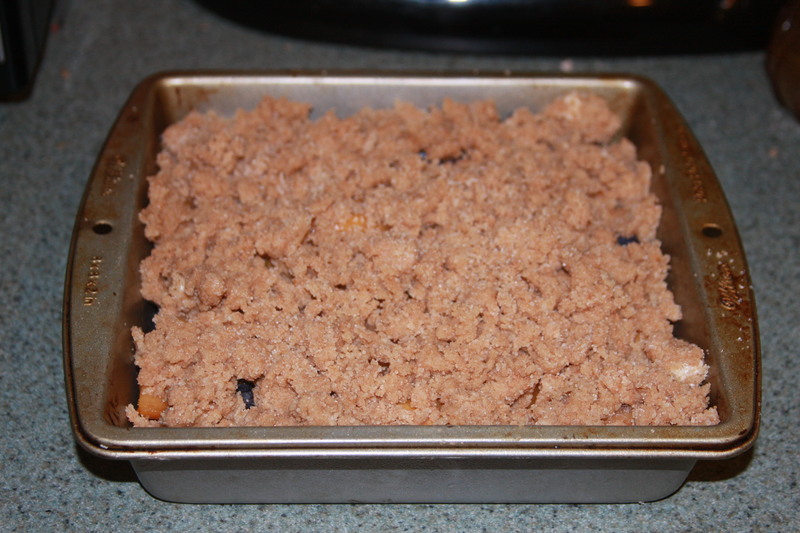 Mix the wet ingredients into the dry ingredients until just mixed but no floury pockets. 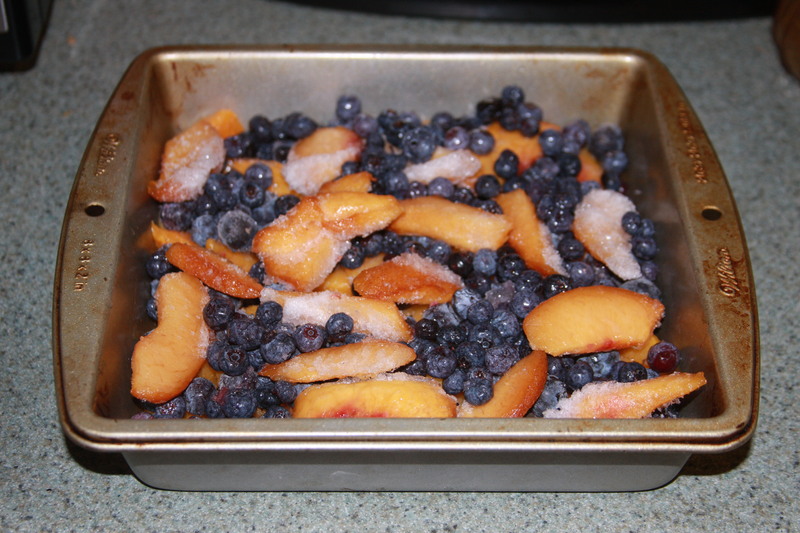 Bake 12-14 minutes on a parchment lined baking sheet until golden and allow to cool. Shortcake biscuits, waiting to be cut and served! 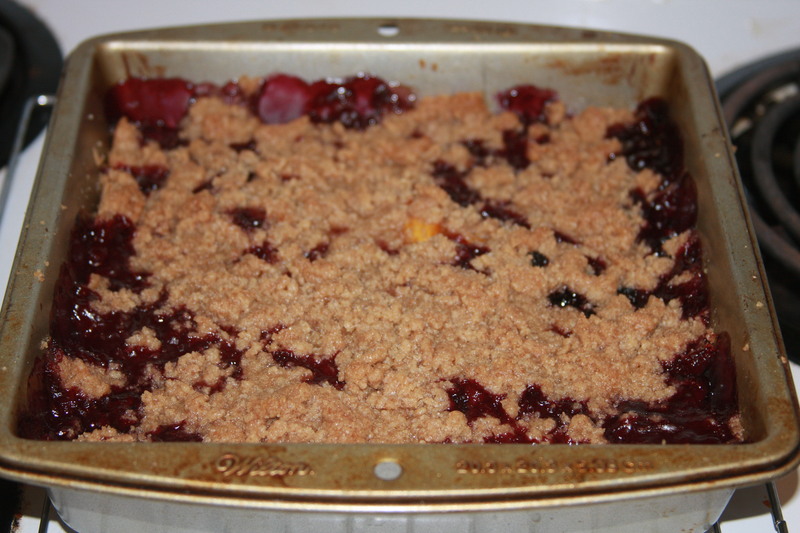 Place maple syrup, lemon juice, and 1/2 cup of the berries in a saucepan. Simmer on low, stirring, until the mixture thickens, crushing some berries during the process. Set aside to cool slightly. Oh yeah… one more thing – I ran across this great little article on vegan baking tips from Vegan Pastry Chef Fran Costigan. It’s a quick, print-worthy/stick it in your cookbook – kind of read! Check it out! People are often prone to thinking that vegans have a hard time getting their protein, when in fact, I don’t seem to find this the issue at all. It is easy to eat plenty of protein (and iron as well) on a vegan diet. Tofu is a great source of protein, as are nuts, seeds, peanut butter, beans, soymilk, and LOTS more… There is a list of vegan protein examples (and lots more about vegan nutrition) here if you want to check it out. Basically to ensure you and your kids get all your needed nutrients, just eat a wide variety of foods… sneak nuts, fruits, nutritional yeast & ground flax on as toppings… & have everyone (including yourself) try new foods for fun! This is one thing being a mom has quickly taught me – kids learn best by watching your example! If the kids are always seeing mom give new foods a try and eating her veggies with gusto, they will want to follow (most of the time)! And if you are still not confident on meeting your nutritional requirements, have everyone take a multi-vitamin to cover all the bases! My favorite vegan kids multi-vitamins are made by Gummi King and Nature’s Plus Animal Parade. 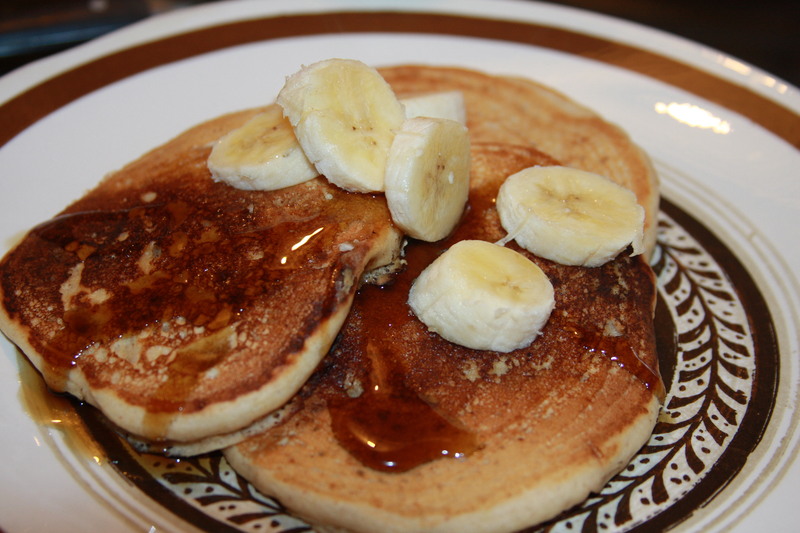 This easy pancake recipe is a great source of protein and is also fast & delicious… Using soymilk, peanut butter, chopped nuts, ground flax & fresh bananas, no kid can turn down this yummy breakfast and no mother can deny the nutritional goodness! My kids really liked these! In large bowl, mix flour, baking powder, salt and sugar. In a separate small bowl, whisk the flax egg together, then add the peanut butter, oil, soymilk, and a bit of water if necessary. Mix wet into dry by whisking until no clumps remain. Pour batter by using a 1/4 cup measure onto a hot skillet. Flip when bubbly. Top with bananas, nuts and pure maple syrup. Devour. 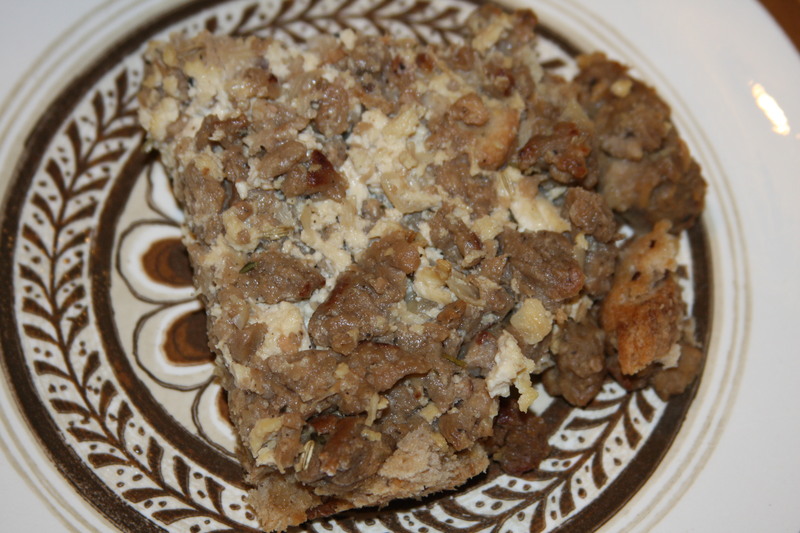 This is a great breakfast or dinner casserole. I could literally eat this for every meal – and so could my kiddos 🙂 It can also be made ahead of time, which is great if you are a busy body. I included this in the “child’s play” category because it’s easy to assemble, but mainly because the kids love helping tear up the bread (though obviously they can’t help cook the “soysage”!). That being said… onto the bread! I find that the heartier/granier the bread the better the casserole. I would not recommend using a really soft bread, as I have found through experience. I really like using Masada 6-Grain bread. I cannot stress this enough- a thick, hearty (or grainy) bread makes the best casserole! 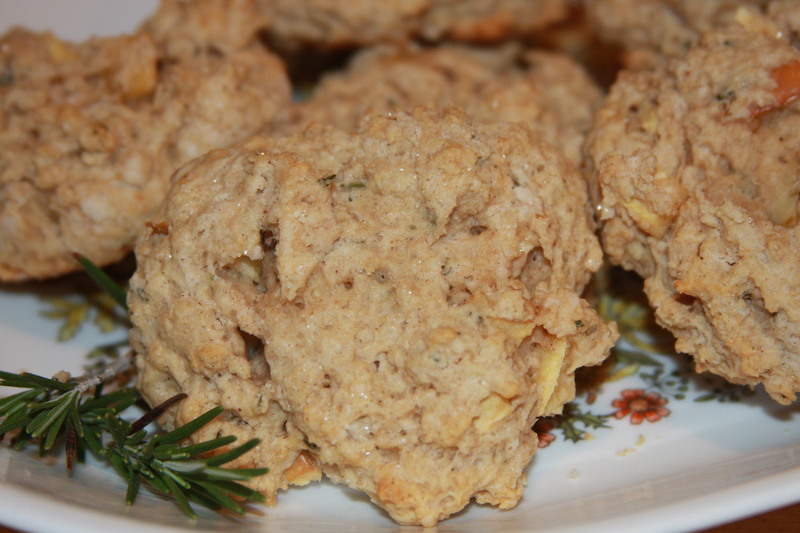 This recipe has been adapted from one of my favorite cookbooks, Vegan Planet, though I have made several changes to the original recipe. 1) Heat the olive oil in a large skillet over medium heat. Add the onion and cook until soft, about 5 minutes. Add the soysage* and cook, stirring until browned. This will take several minutes. Once browned, remove from heat & set aside. *If you are using Gimme Lean Soy Sausage, do this by tearing it into little bits (roughly 1/2″ – 3/4″ pieces) and throwing them right into the skillet. It’s a little sticky and mushy… just keep ripping it into small pieces (you can chop them up further with a spatula if necessary while you’re stirring them around with the onion) then continue following recipe above, cooking until lightly browned. 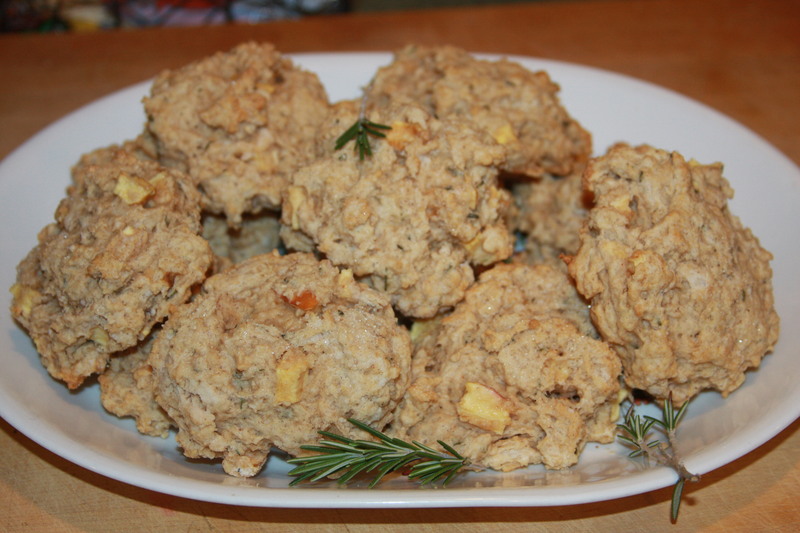 2) In a large bowl, combine the crumbled tofu, milk, thyme, fennel, and a little salt and pepper to taste. Mix well, then mix in the sausage mixture and set aside. 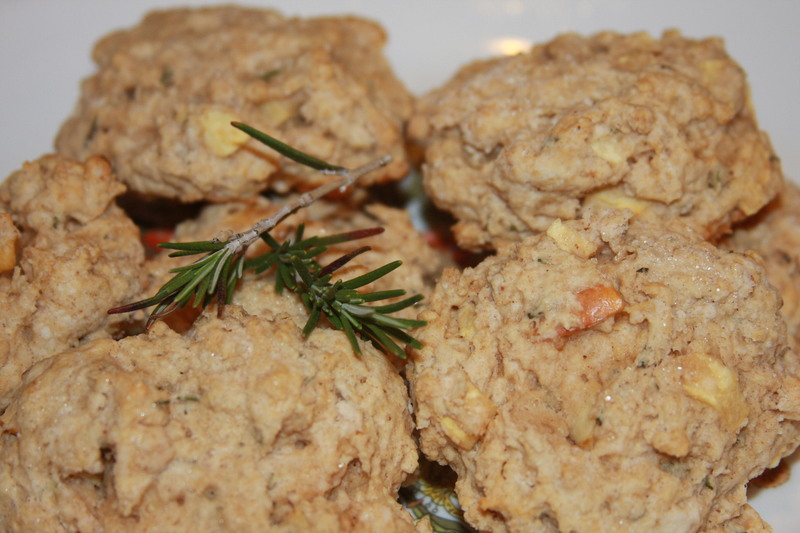 4) Preheat oven to 350 F. Bake until the casserole looks puffy and lightly browned, about 45 minutes. Let sit for 10 minutes before cutting and serving. Let cool slightly. Devour! Mmmmm! I could eat this for every meal!